What's Open and Closed Montreal Easter Weekend? What's open and closed Montreal Easter Weekend April 19 (Good Friday) through April 22 (Easter Monday), 2019? The list below sums up what to expect, from which museums are open to which major attractions are closed, but it isn't exhaustive enough to cover every mom and pop shop, restaurant, store, and government branch in town. If in doubt, call the commerce, business or agency you wish to visit directly for detailed scheduling information. Most, if not all City of Montreal offices are closed Good Friday and Easter Monday, including Accès-Montréal offices and borough offices. Some exceptions may apply, including the 311 information line, which operates throughout the Easter weekend, including on Good Friday and Easter Monday. Call 311 to confirm which offices are closed in your neighborhood. Check garbage schedules online or call 311 if your street's regular garbage recycling collection happens to fall on Good Friday or Easter Monday. All Ecocentres open on Good Friday from 8 a.m. to 6 p.m. but will close Easter Monday. Federal offices, which include employment offices, are closed Good Friday and Easter Monday as are provincial offices such as immigration offices. Call the office/service you're concerned about to double check as some exceptions may apply, such as government-regulated SAQ liquor stores (consult SAQ holiday schedule details here). Montreal's public transit system operates through Easter weekend, with bus routes running on special schedules on Good Friday and Easter Monday. Metro intervals are set at 10 minutes. Consult the STM website or call (514) 288-6287 for specific schedules by bus route. As for the five above ground commuter train lines, Good Friday and Easter Monday follow a reduced weekend schedule rather than their usual weekly runs. Consult the AMT website for specific details or call (514) 287-8726 or toll-free at 1 (888) 702-8726. The Montreal Municipal Court at 775 Gosford is closed on both Good Friday and Easter Monday only. Call (514) 872-2964 for details. Montreal parking meters follow their regular schedule throughout Easter weekend. No exceptions. The restaurant situation in Montreal on Good Friday and Easter Sunday is not quite as dire as say, on Christmas. Quite the opposite, things should be hopping. Just call your restaurant of choice and book a table. Here are some Montreal Easter brunch recommendations. Heading out for a night on the town? Chow down at these top late night food joints in Montreal. Montreal movie theaters tend to be open during Easter weekend, including Dollar Cinema and downtown's Scotia Bank Cinema. Montreal's quintessential corner stores, at least the 24-hour chains, generally remain open, but this is at the discretion of the owner. Most chains remain open as they're under no legal obligation to close. Call your local pharmacy if in doubt. Montreal SAQs (alcoholic beverage stores) generally stay open Good Friday and Saturday. As for Easter Sunday, SAQ Express stores stay open until 10 p.m., as per usual, and some SAQ Classique stores stay open too but SAQ Selection & Signature stores are typically closed Easter Sunday as well as SAQ stores located inside shopping malls. Most SAQ stores are open Easter Monday, except for those located inside shopping malls which may be closed that don't have doors that open directly onto the parking lot or through a movie theater. In other words, if you have to walk through a mall hallway to get to a given SAQ and that mall is closed Easter Monday, then the SAQ is closed too. Grocery stores larger than 375 square meters (4,037 feet) in size are not legally allowed to open Easter Sunday. Grocery stores 375 square meters (4,037 feet) or less in size can remain open at their discretion, though hours are usually reduced. Always check with your local grocer as it varies by store. Montreal's public markets, including the Atwater Market, Marché Jean-Talon, and Marché Maisonneuve are open regular hours on Good Friday, Saturday, Easter Sunday and Easter Monday. Old Montreal's Bonsecours Market is open from 10 a.m. to 6 p.m.
As a general rule, Canadian banks and financial institutions are closed on Good Friday but open Easter Monday. By law, Quebec retail stores are not allowed to open Easter Sunday, except for bookstores, flower stores, and antique shops as well as service-based businesses like hair salons, restaurants, gas stations and manufacturers who are free to open as they please. Call the Montreal shopping mall of your choice to confirm opening hours from Good Friday to Easter Monday. Residents are encouraged to call these facilities directly as their holiday schedules vary by neighborhood. The Complexe Sportif Claude-Robillard typically closes Good Friday and Easter Monday. The Montreal Planetarium is open all Easter weekend, including Good Friday and Easter Monday. The Montreal Science Centre screens IMAX films and offers access to its family-friendly exhibits through the long weekend. The Montreal Botanical Garden and Montreal Insectarium are also open every single day of the long weekend. Meanwhile, the Pointe-à-Callière Museum also stays open all the way through the long weekend, including Good Friday and Easter Monday. Anticipate other Montreal museums not listed above to be closed Easter Monday but always call to double check. The Montreal Casino is open. 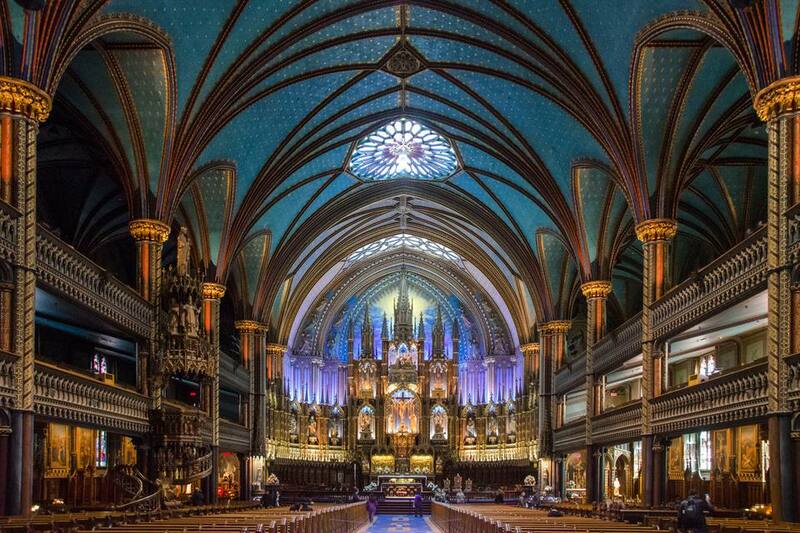 So are the Notre-Dame Basilica and St. Joseph's Oratory. Also, consult this roundup of top Montreal Easter events for more things to do throughout the long weekend. Every season is ice skating season at Atrium le 1000. The downtown indoor rink is usually open Good Friday, Easter Sunday, and Easter Monday. Call before going to confirm this year's schedule.